If you're anything like me, then the majority of life's little moments are captured via your cell phone camera (especially if you have a child or pet). It's not hard to figure out why that is. In today's world we are attached to our cell phones so when that picture perfect moment occurs, we can instantly capture it. Camera phones had a bad reputation regarding photo quality until recent years, now you don't even need a pocket digital camera because your phone can do just as good. I by no means consider myself a professional photographer, but if you're like me, just your average bear, then this post is for you. The key for taking pictures with your phone is to snap as many as possible so you are sure to capture that picture perfect moment. Don't worry about centering your subject or zooming in just right because if you wait too long your baby's smile can quickly turn into a frown. Charlotte was making the cutest faces while we were shopping so I quicly snapped this picture. As you can see from the edited version, I was able to center it a little better to make it look like I captured this picture perfectly the first try. Always know you can edit your pictures. In fact, I edit almost all of my pictures right off the bat. You'll be surprised what cropping a picture can do for you! But if you're looking for a little more editing functionality then you should try out the VSCOcam app. I am still learning how to use all the features, but what I like is you aren't forced to rely on filters to fix your pictures. Don't get me wrong, I love the Instagram filters just as much or more as the next guy, but sometimes there isn't a filter to fix your picture. What's cool about this app is you can use filters if you want or go into the settings and change the sharpness, exposure, tinting, shadows, temperature etc. I can continue to bore you with all the details or you can just check it out for yourself! Download the app, give it a try and let me know what you think! In this picture I was able to straighten the horizon from my original. I also worked with enhancing the colors to give it more of a pop. This picture needed less shadows and a bit of sharpening to get it the way I wanted it. This has been a crazy week in case you couldn't tell by the lack of posts. I feel like I've been all over the place with no time to catch my breath. Don't get me wrong, I love being busy but I hate when I don't have time for the things I want to do, like blog. It is all just a matter of getting in a routine, so hopefully by next week I'll be back in full force! In the mean time, take a look at my highlights from the week! We spent Easter in Richmond at my in-laws and this was the sunset from their back deck. Can't beat that view! On Friday, my friend and I made a pit stop at our favorite winery and enjoyed a bottle of local wine. It wasn't quite warm enough to sit outside but lucky for us they have a cellar inside that provides a fun atmosphere. I can't wait to take the whole family to La Grange this summer and picnic outside. Living in VA wine country definitely has its perks. Charlotte hit a milestone this week! 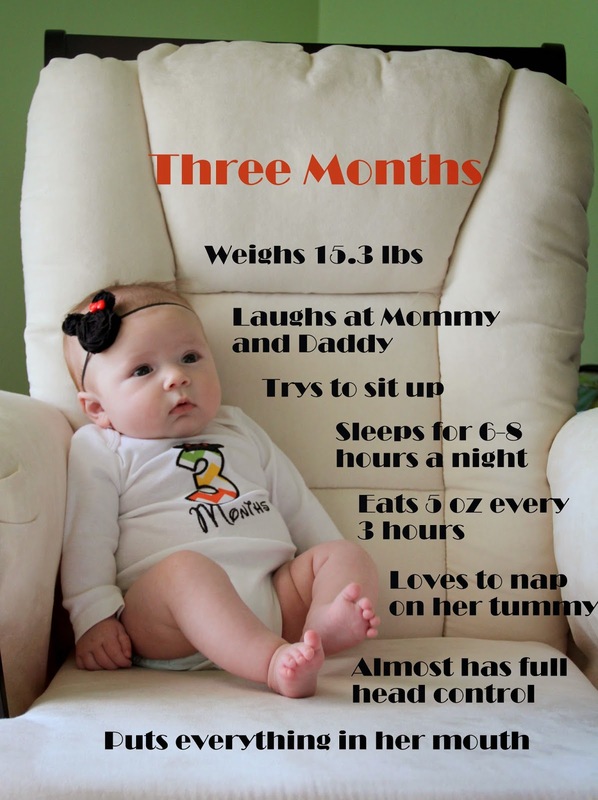 She can sit up with a little assistance from a boppy or couch! Her head control has gotten really strong which allows her to balance without folding over. Makes her seem like such a big girl already. 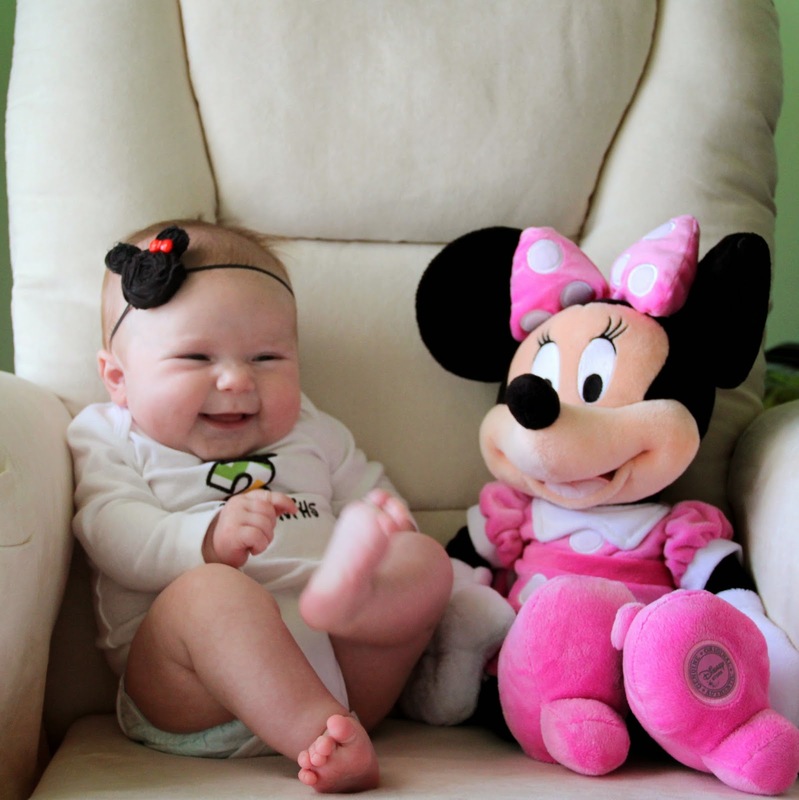 Our little girl is such a content and happy baby. She loves to babble, blow bubbles, and talk to whoever will listen. This is her caught in the action of a really intense conversation. Easter has always been an important holiday growing up. Like Christmas, there are the secular traditions and the non-secular ones; my family celebrated both. We had the Easter egg hunts and Easter baskets but still kept the focus as a religious holiday by going to all the services Holy Week had to offer. Now that I'm the parent, I find myself really getting into the spirit of the holidays. I had so much too much fun getting Charlotte's Easter basket together and picking out her sweet little Easter dress. I have a feeling Christmas is going to be dangerous! Since Charlotte is so young for her first Easter, I just put things I was going to buy or had already purchased in her basket so it didn't feel like another expense. I put bottles, an Easter rattle that I got last year after Easter for just $.98, a Vera Bradly blanket that a friend gave me, an outfit and a headband and shoes set that I had ordered a while back on GroopDealz. As you can see, she LOVED her Easter basket! From my family to yours, I hope you had a wonderful Easter however you chose to celebrate! Sorry for the lack of posts this week. Since it was my first week back full time in the office AND the start of daycare, things have been a bit hectic to say the least. We are all getting a routine established and I totally forgot to account for blogging time! Busy or not though, this has been a great week! My friend was at Old Navy last week and picked up this hilarious onsie! So fitting for our little family, don't you think?! I couldn't resist stopping by the mall to get an Easter bunny picture for Charlotte's first Easter. I'm so glad she cooperated and had a genuinely good time. I'm sorry but this picture is just my favorite! As you know, this was a big week with Charlotte starting daycare. I'm not going to lie, it's been awesome! It's forced me to start a nighttime routine with her and now she sleeps through the night in her crib. I think daycare tires her out! After about 2 years of debating on buying one of these planners, I decided to just bite the bullet and do it. Erin Condren was having a sale, so there was no better time than now to give it a test run. Everything you need is in this planner and I can't wait to organize my life! Not to mention, it came with cute personalized labels too. Basically I'm in love and have decided that every January I will be sure to budget for a new one. I don't think I can live without it and I haven't even had it a week! I hope everyone gets to spend some extra time with family this weekend and enjoy Easter and the rest of your spring break! Everyone talks about how emotional it is when you drop your baby off at daycare for the first time, so needless to say I've been dreading this day for a while now. Even though I've been back at work for a month, but my mom has been watching Charlotte on the days I was in the office so it hasn't been a big deal. Prepping is the worst part. You see, when Charlotte was with my mom, I didn't have to pack or worry about anything! Grandma always has diapers, wipes, bottles, formula and even spare clothes. But daycare, that is a different beast. I have to provide all those things plus sheets! I was running around last night trying to label everything and hoping I didn't forget anything. Think I have enough bags?! Not only was I packing for the drop off, but I'm also trying to work out at after work so I don't have to do it when I get home. Needless to say I had a TON of bags. So much so that I had to have my husband help me load the car because all these bags plus Charlotte would have been impossible in one trip! The drop off went well. I think being packed and prepared the night before helped with the stress and anxiety of such a big day. Everything ran like a well oiled machine because I also made sure that both out outfits were laid out for the whole week. The key is going to be to make sure I keep up with this routine every week! 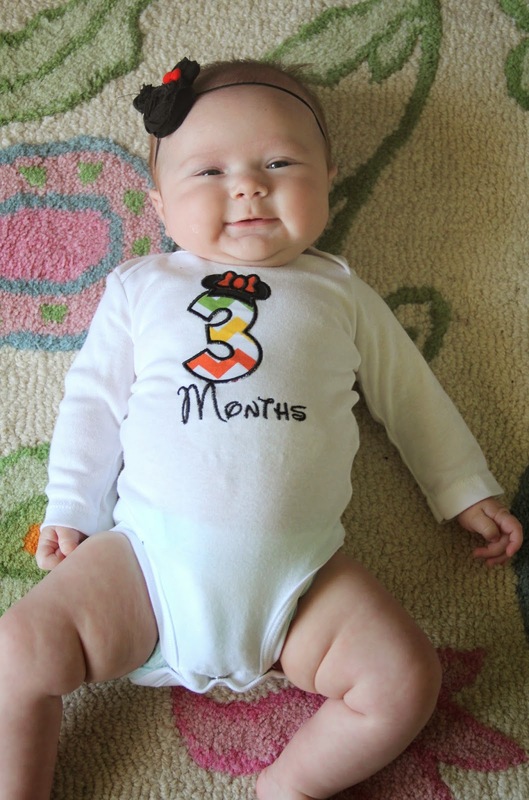 Today is April 9th and that can only mean one thing....Charlotte is 3 months old today! Time for another month update! Eating - Charlotte just seems to not be able to get enough. We bumped her up to 5oz hoping she would last longer between feedings....nope. She still eats every 3 hours during the day, but at night she will go 6-8 hours between bottles. I guess she is stock piling during the day for nighttime. I'm definitely not going to complain about that! Sleeping - She has really gotten a hold of this whole sleeping thing. She takes cat naps during the day but will sleep most of the evening starting at 8pm. Sometimes she will sleep through her next bottle and will wake up around 4am to eat, but now I'm trying to get her to eat again at 11 or 12 because then she'll sleep until 6am! We found it easier to have her in our room at night in the beginning because she liked sleeping propped up and it made waking up and feeding every few hours a lot easier if she was right next to us. Now that she is getting older, we are putting her in her crib at night but are finding she isn't sleeping as soundly. If she sleeps in her crib, she wakes up between 3 and 4 no matter what. So sometimes we let her sleep in our room again because we can almost guarantee a full night's sleep. 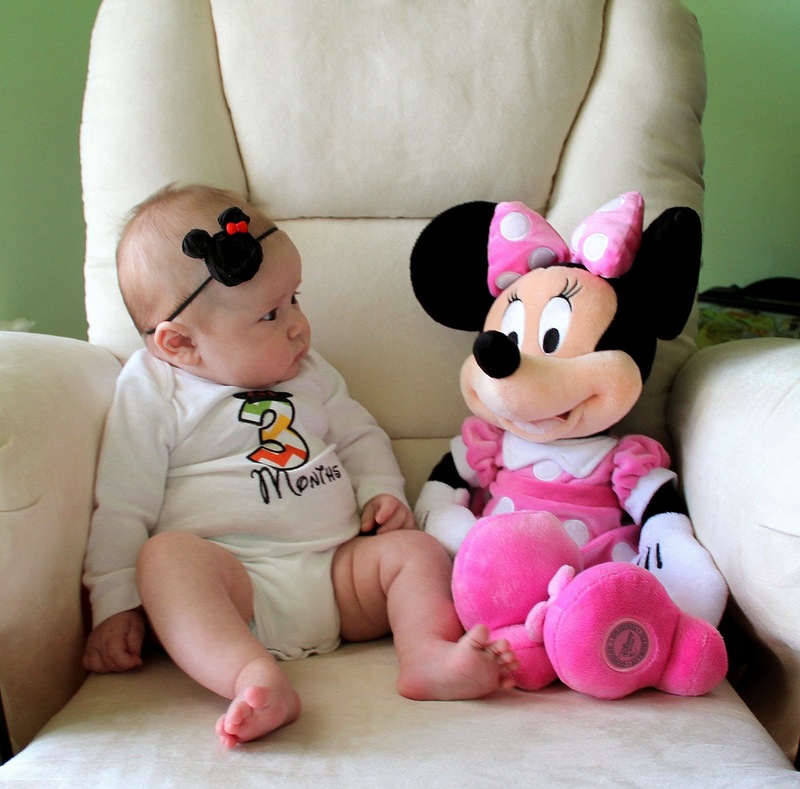 I can't handle the way she looks at Minnie every single time! 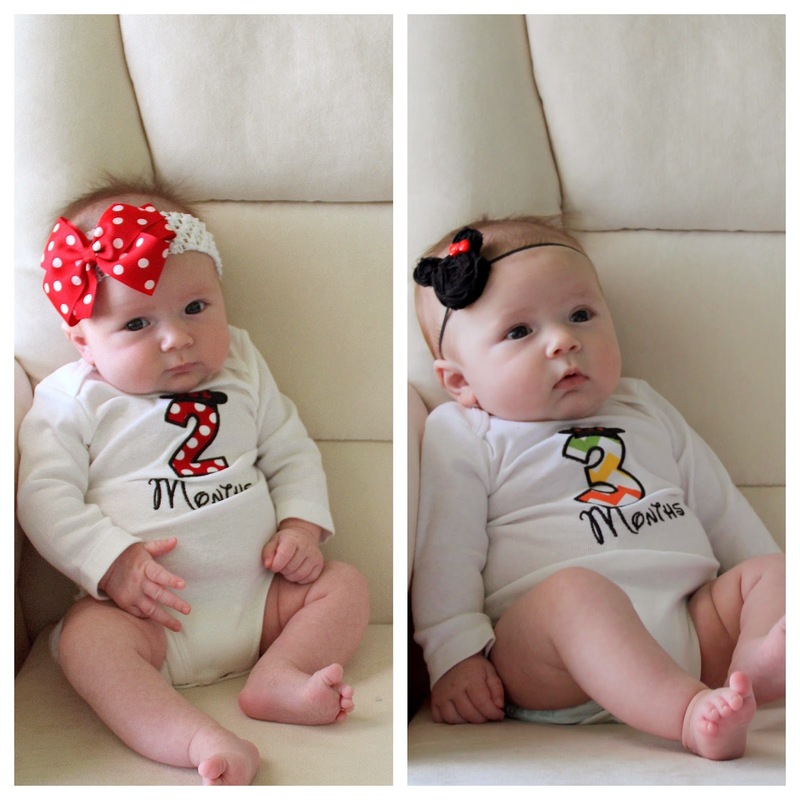 Three months of this same picture cracks me up! Likes and dislikes - There aren't too many things Charlotte doesn't like these days. She is still indifferent about the bath, but other than that she is quite the happy baby. She loves car rides, peek-a-boo, and her Wubbanub. She giggles and babbles a lot in the morning and in the evening. Charlie loves her bobby, blankets and anything she can put in her mouth. Here is her comparison from last month. I think she grew A TON! 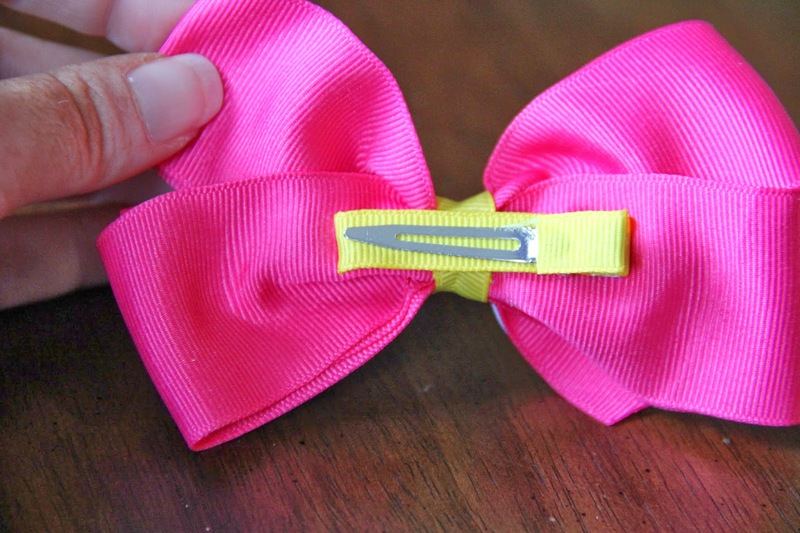 If you follow this blog, then you've probably already seen the DIY bow post I did a while back. 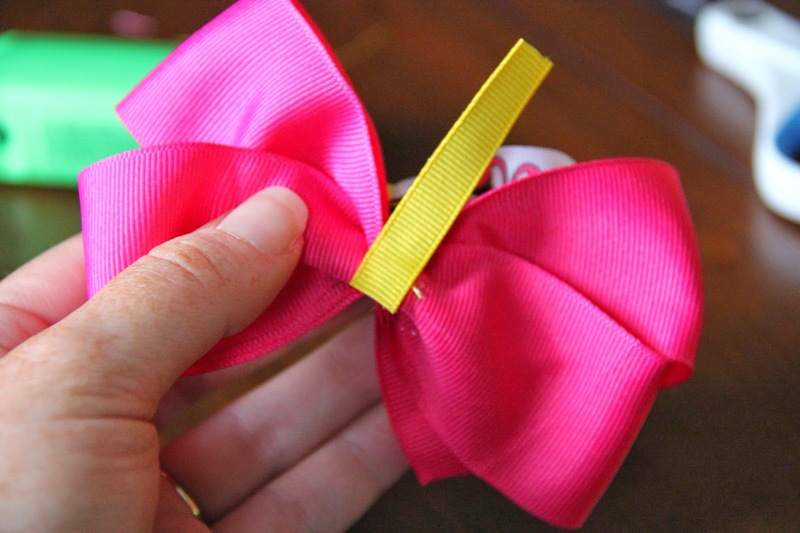 Today I'm going to show you an alternate way to make the same style bow. Personally, I like the end result of these much better. 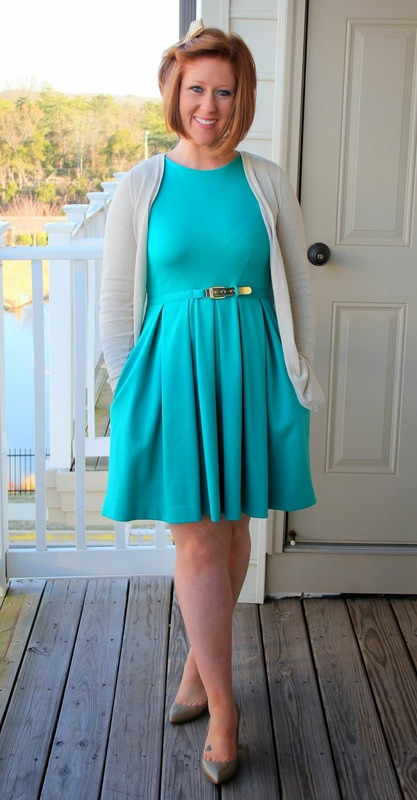 Don't let the amount of pictures and steps intimidate you because this is super easy to do. I just wanted to make it as detailed as possible. 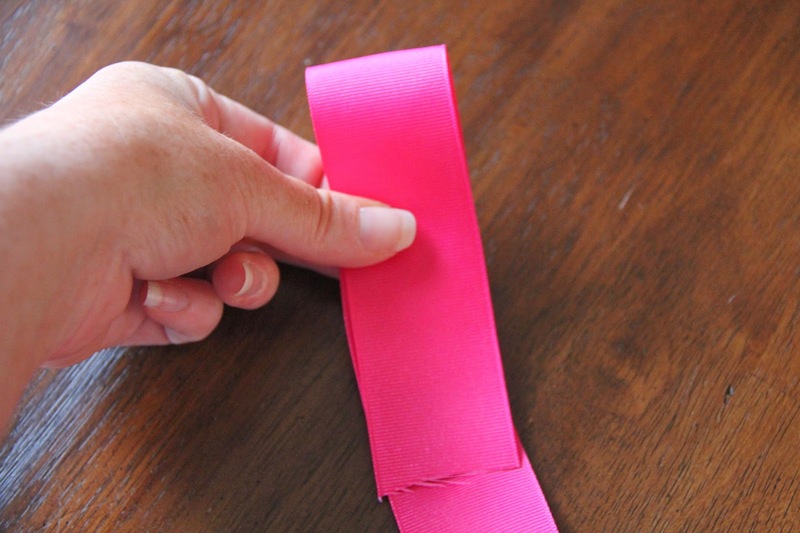 Step 1: Take the main ribbon you want the bow made out of and fold one side to measure 4.5 inches. This will vary depending on the size of bow you want. You can make this fold longer or shorter to change the overall size of your bow. For this tutorial, I am making a 4.5 inch long bow. Step 2: Now take the long end and fold it up towards the first loop you made and bring it around the back so you now have two loops. Step 3: This is the tricky part. After you make the second loop, take the loose end from the back and tuck it between the first and second layer in the back. Hopefully the picture kind illustrates it as this is the key part. Step 4: Once you have that back piece tucked in, you will bring the tail up to the front. 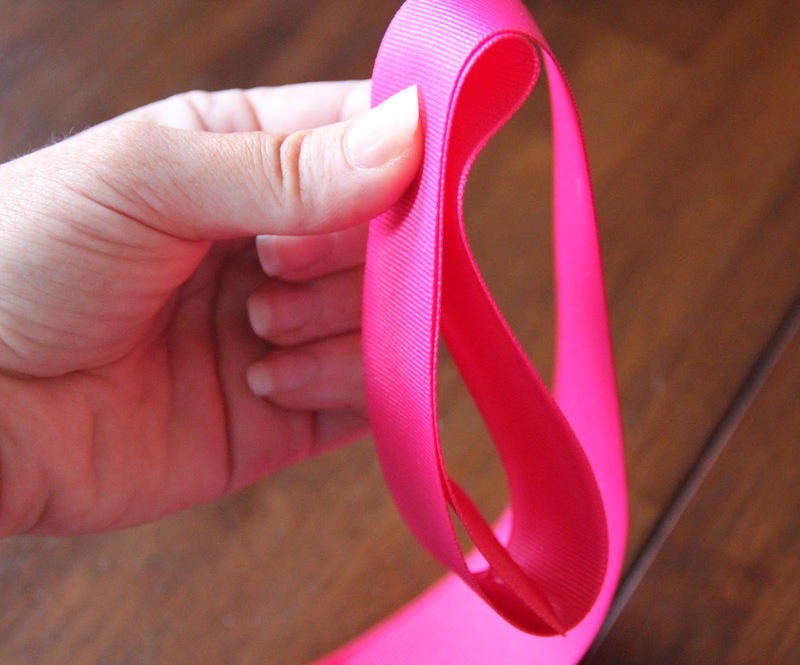 The ribbon doesn't naturally want to go this way, so be sure to hold it all together. Don't worry, if it falls apart a few times, just practice looping and you will get it. Step 5: Using both hands, you want fold the sides in towards the center and then peel the outer edges away from the center towards the back. This creates the pucker you see below. It doesn't have to be perfect. you can even just pinch in the middle and you will get the same effect. At this point, transfer it to one and hold the center together with your thumb and first finger. 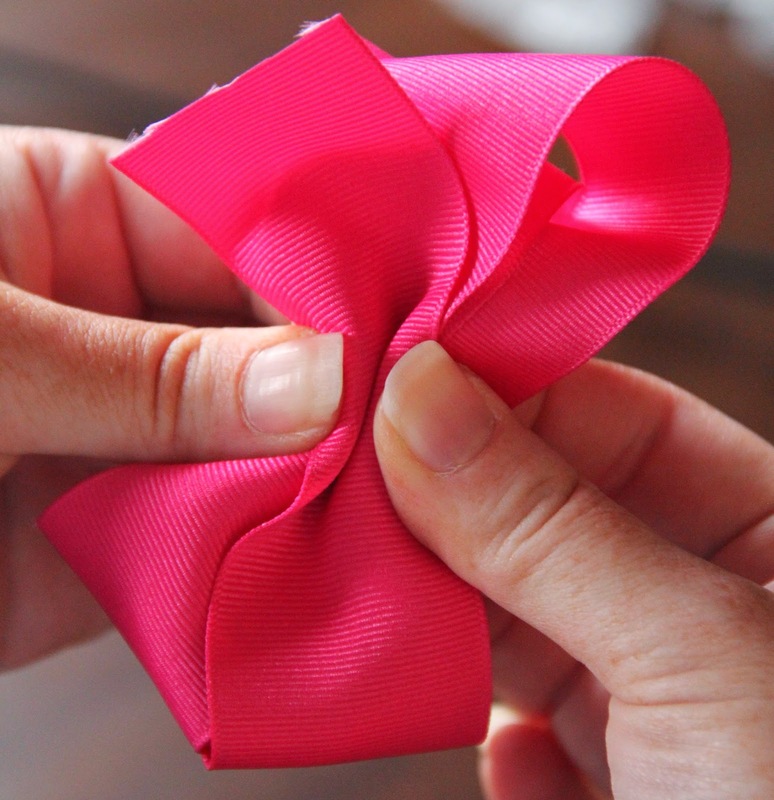 Step 6: While holding the bow in one hand, take your piece of thread and wrap it around the center. This will hold everything in place while you put the finishing touches on. Wrap it around as many times as it takes to make it feel tight. Then tie your two end in a knot on the back to secure it. 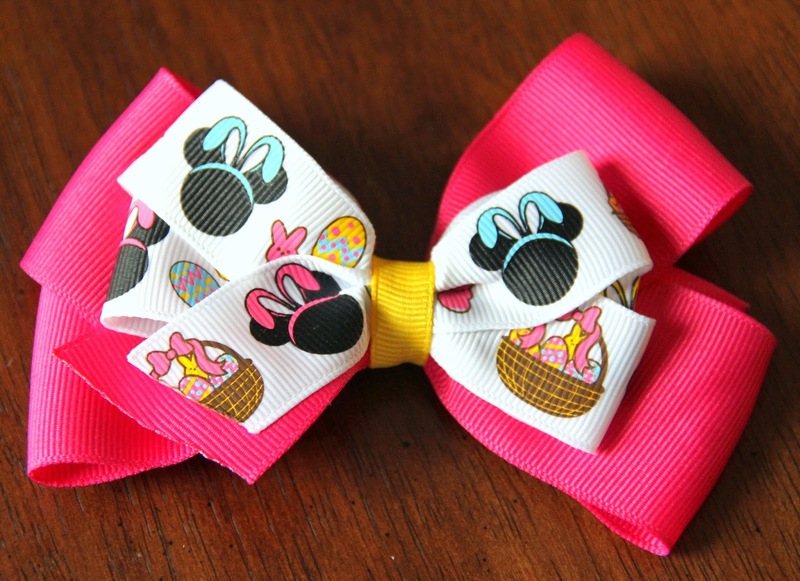 Step 7: This is the point where you get the bow exactly how you want it. For instance, I never tie the thread in the middle the first time, so I just slide it down until it is centered. Once it's centered, I fan out the loops a little bit to make it as symmetrical as I can. During this step I take the opportunity to finish the tails. First I cut off any extra ribbon at an angle to give it that polished finish. Then I take a lighter to the ends which will keep them from fraying. 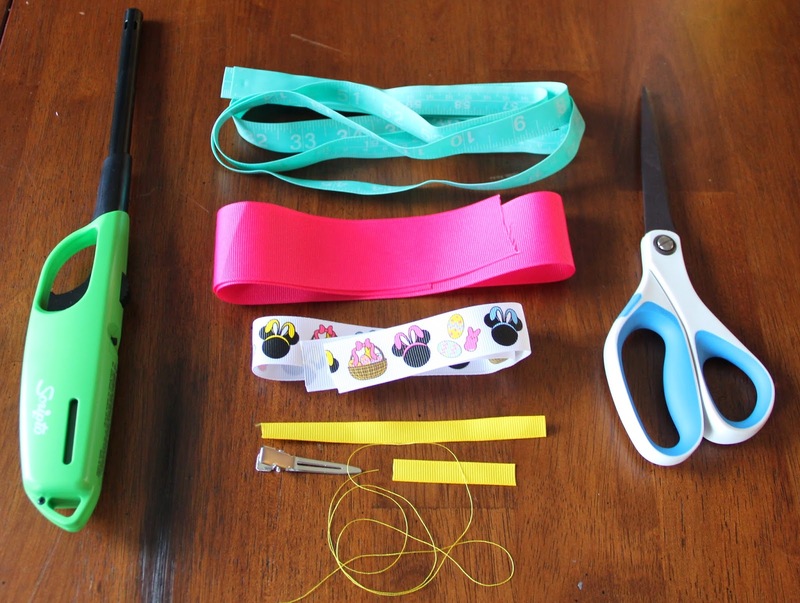 At this point, if you want to make a stacked bow, go ahead and take your medium sized ribbon and follow the steps above to make a smaller bow. 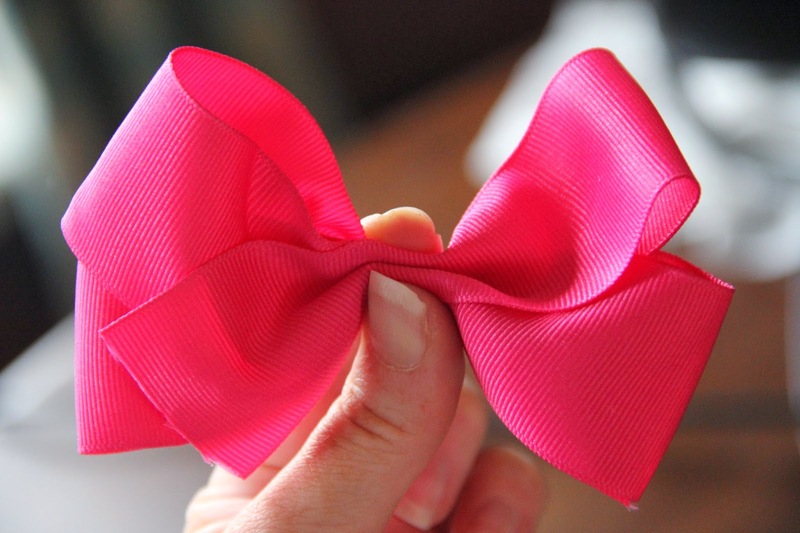 You will place it on top of the bigger bow and follow the rest of the steps below. 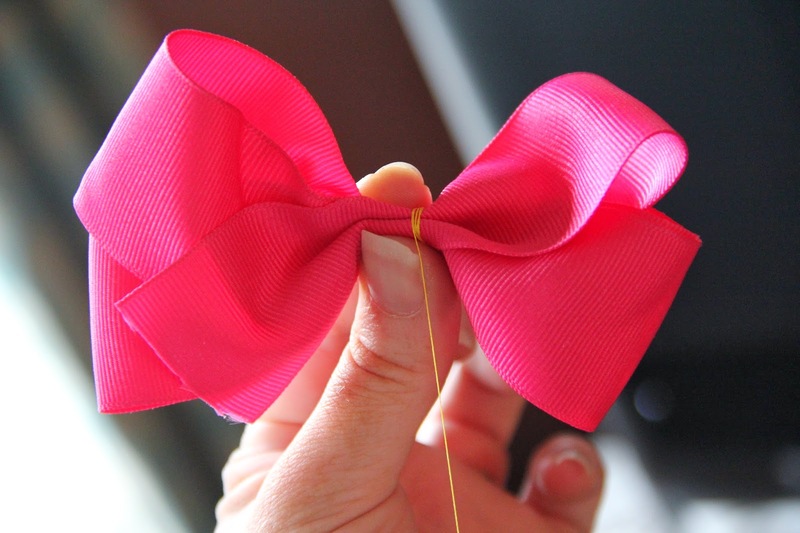 Step 8: Take the 2" piece of your skinny ribbon and put a glue dot on one end and press it to the back of the bow. Step 9: Now just wrap (as tight as you can) around the bow. When you get the back again, put some glue on the end to close it up. 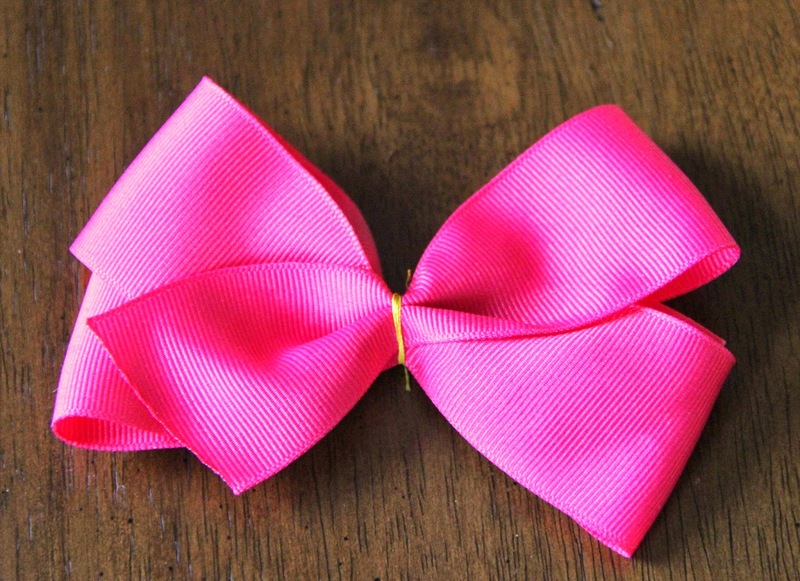 I made mine a double bow, but here is what it should look like now that you have made the center. 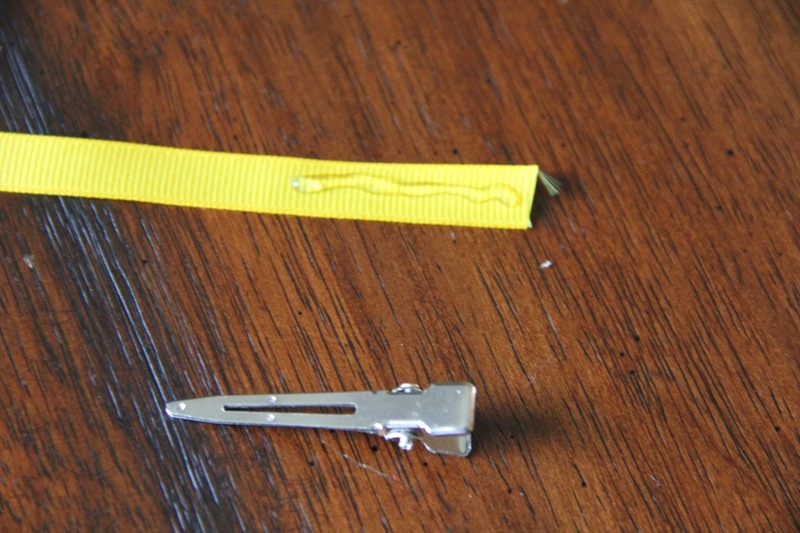 Step 10: The last step is to make the alligator clip. 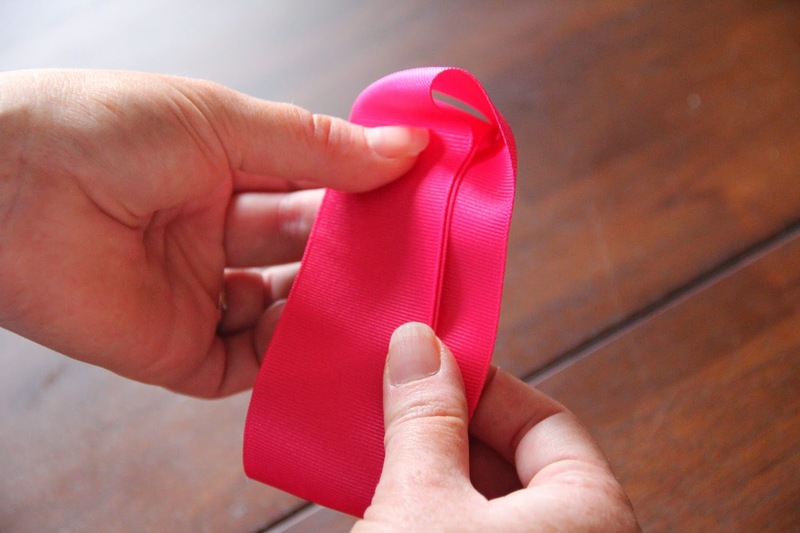 Take the 5" piece of skinny ribbon and put a strip of glue on one end. 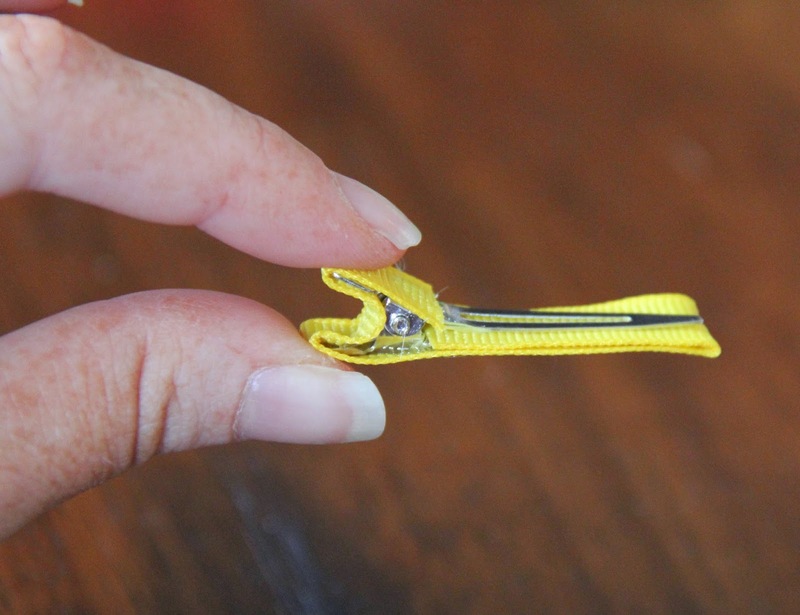 In one hand, open up the alligator clip place the ribbon down on the flat end (this is the end you want to cover). Step 11: Now that you have it in place, add some more glue to loose side and place over the flat piece so that you are wrapping it around. Make sure you can still open and close the clip. 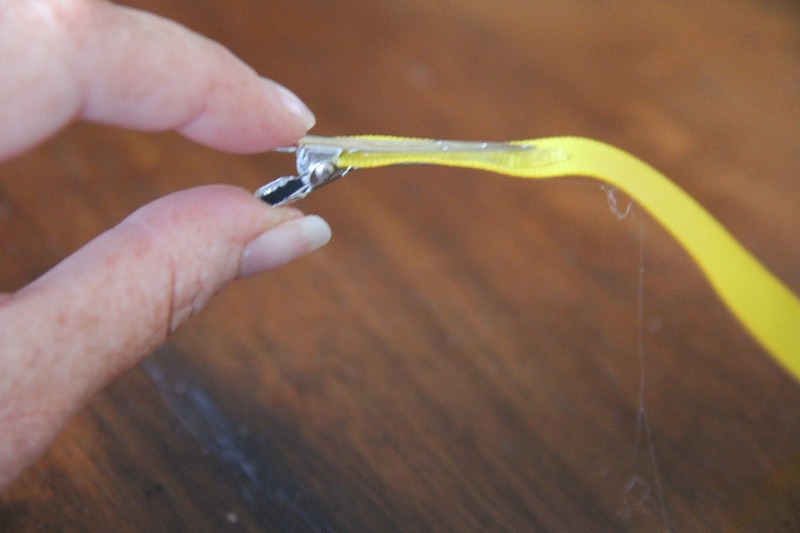 Step 12: Keep adding a little glue at a time and wrap the top part of the clip. You will cut it off and stop wrapping once you reach the other side. You leave this side exposed so it slides into your hair easier and holds better. 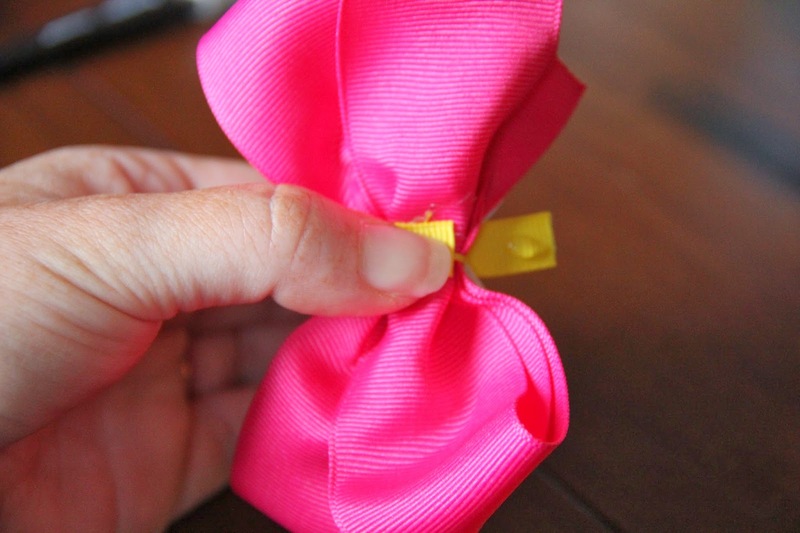 Step 13: Glue the clip to the bow ribbon side down. I know it was a lot of steps, but hopefully it was broken down enough to make sense. 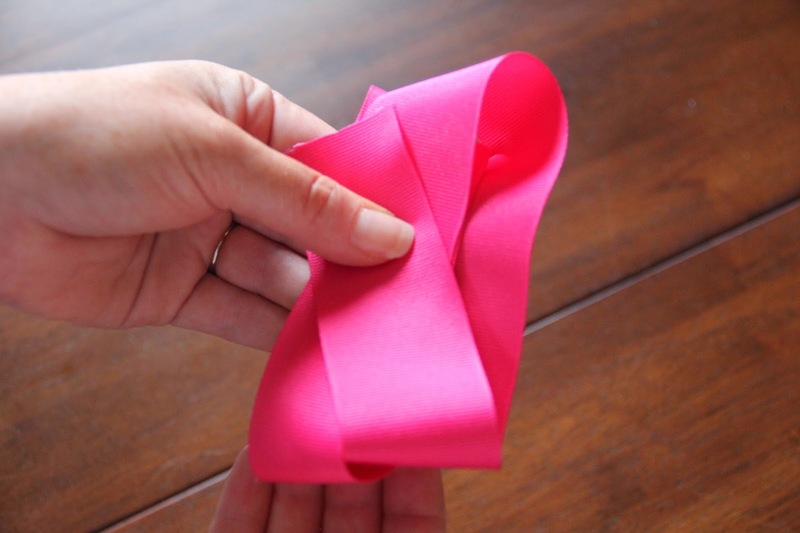 I know the beginning can be tricky and it will definitely take a few times to fold it just right but just keep working it and once you get it, it will be super easy! I know I'm posting this super late, but I want to make sure I stay on top of documenting my weight loss because it's what holds me accountable. This week has been super busy and overall a good week. I still struggle getting myself out the door and running, but I tell myself even if it's only a few times a week, it's better than not at all. My ultimate goal is to get myself running 5 days a week. I took advantage of the nice weather and went for a run around my neighborhood. It's not my favorite route but it was good to encounter some inclines and soak up some vitamin D while I was at it. I'm making progress and am able to run longer with less walking, so I consider that a big success. And before I know it, I'll be back at the pace I was last year! For my weigh in, I was down a pound which puts me at: 168.6. I'm very happy with this number for this week and hope I can keep it up. I worked very hard on my eating and I'm continuing to make smarter choices without sacrificing the things I love. I know this was just a quick update with no pictures, but I needed to at least keep up with tracking my progress. I'm hoping to get a little more creative for next week! It's April and it looks like spring has finally sprung! To celebrate, I packed up the tights and busted out the bright colors. It's amazing what adding color to your wardrobe can do for your mood. 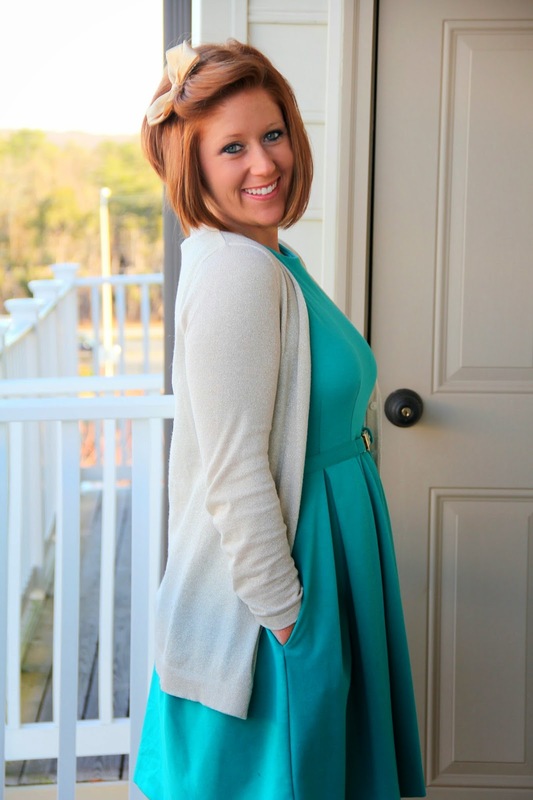 I'm walking around with a little extra spring in my step today (pun intended)! Best part of this dress? It has pockets!